BARBOURSVILLE, West Virginia – Volunteer assistance is welcomed at the 7th annual Spring Cleanup at Beech Fork State Park near Barboursville in Cabell and Wayne counties. The event is scheduled from 8 a.m. to about 4 p.m. Saturday, April 4, 2015. “It’s a full day of work which can be lot of fun,” said Dillard Price, assistant superintendent at Beech Fork State Park. Volunteers are asked to register in advance to participate. Lunch will be provided. Volunteers will be assigned to work the various areas that have been designated for cleanup. This event is one of many Make It Shine programs sponsored by the West Virginia Division of Environmental Protection and West Virginia Division of Highways. 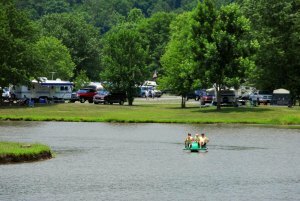 A registration form can be printed from the Beech Fork State Park’s event Web page at www.beechforksp.com. Call 304-528-5794 or email beechforksp@wv.gov for more details.